The strobe causes the apparent speed of motion of the string to decrease as the user approaches the correct frequency. as the the string gets closer to tuned, the string's vibration will happen in visible pulses of speed and apparent lethargy, which slow as the tuning improves. These variations in speed should coincide with the frequency of audible "beats" when beat tuning. Once again, a problem has been solved neatly with an Arduino-based solution. The circuitry is quite simple, and it can be found as well as design details and the matching code here. 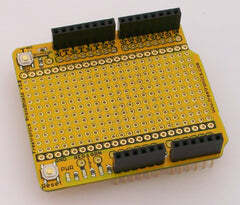 When creating projects with external circuitry to work with an Arduino-compatible project - consider our range of ProtoShields. From the tiny LeoStick to the Mega range, we offer a complete range for you to work with.